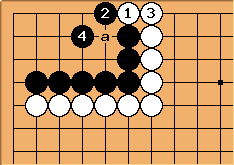 The hane-connect in this diagram is a well known endgame play. 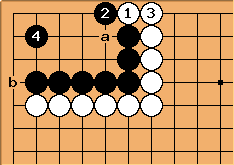 White will now usually defend at a, b, or perhaps c.
However, in the corner, there is sometimes a better option. 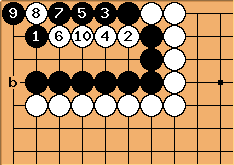 White plays hane and connects, and black must defend the cut now. 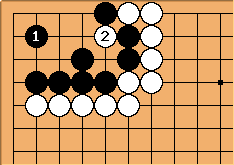 is wrong, as is the move at a. 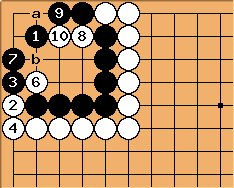 After , white can play another hane-connect, - , in sente. 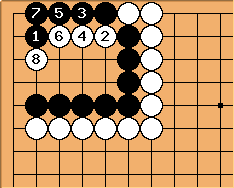 Black needs (or b) to defend again. The right answer is to play . This not only defends against the cut at a, it also makes the hane at b gote for white. 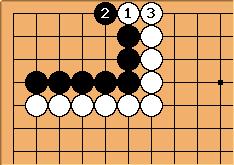 With , black protects both sides with one move. 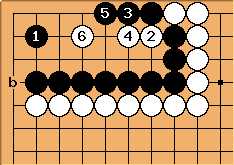 The technique shown only works in limited situations where is not too far away from the cut, and is close to the other hane. It is also, of course, important to check for other weaknesses related to the cut, such as this one.